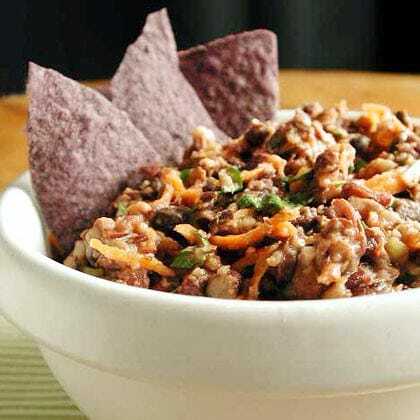 Full of fiber and flavor, this tasty black bean dip recipe is incredibly filling. Serve it as a dip with fresh veggies, baked pita chips, or baked tortilla chips as a delicious and healthy appetizer recipe. I also used this dip as a sandwich spread on a turkey breast sandwich. Deelish! This is really such an easy dip recipe, you can make it in no time, so it’s a great snack idea if you need to whip up something healthy – fast! Also, I am obsessed with spicy foods, so if you don’t like things as hot as I do, just take out the jalapenos in this recipe. :) Though this is not an official one of Weight Watchers Dip Recipes, it’s 1 Point servings, make it an ideal dip for any dieter. Blend all ingredients in a blender or food processor blend until chunky or smooth (depending on which consistency you prefer) Spoon into a serving bowl and garnish with cilantro. Hi Lisa! This is an old recipe that I haven’t revised yet with the new Freestyle Points plan (I’m a one woman show over here, and it takes me a LONG time to update all my old recipes!). But yes, this recipe would be 0 Freestyle Points. Thanks for reading! I made this and it’s great, a really unique mix of flavors. I love all your recipes! I just want to double check that the serving size on here is correct. I can't figure out how this recipe would make 8 1-cup servings… there just aren't that many ingredients? Ahhh! Thanks for catching that typo! It's actually 1/4 cup for a serving. I just corrected it in the post. Thanks again!